Dry to wet. 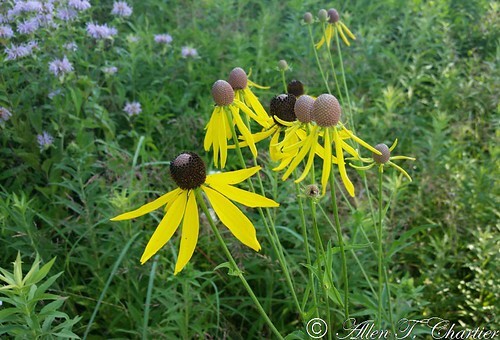 Prairies, woodland openings. Full sun. This is an erect, 16″ to 48″ tall, perennial forb that rises on a single stem or 2 to 12 or more stems from fibrous roots and either a woody, underground, storage organ (caudex), or often a short, stout, horizontal, underground stem (rhizome). It sometimes appears clustered. 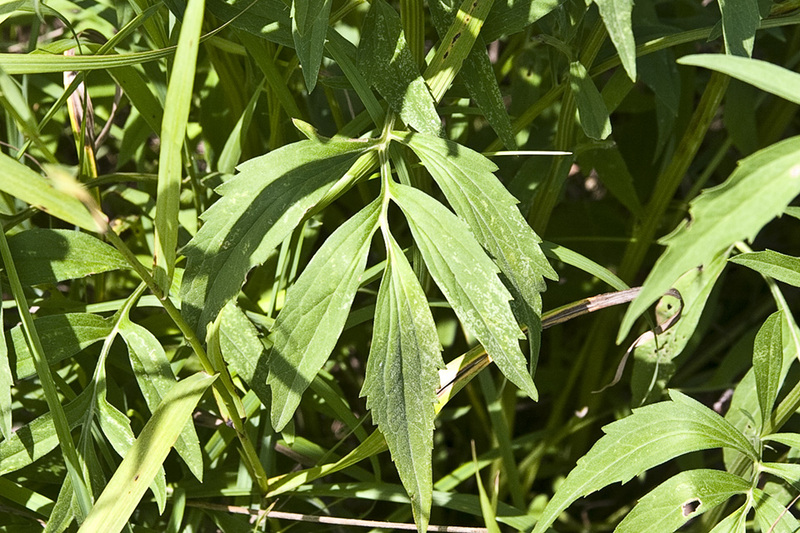 A single stem or 2 to 12 or more stems rises from a rosette of basal leaves. 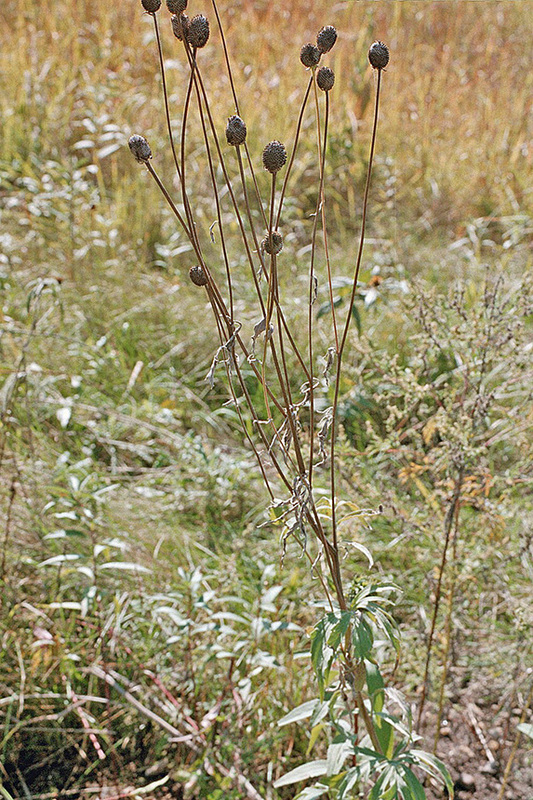 The stem is erect, rough to the touch, and branched only above the middle. It has several longitudinal ridges. 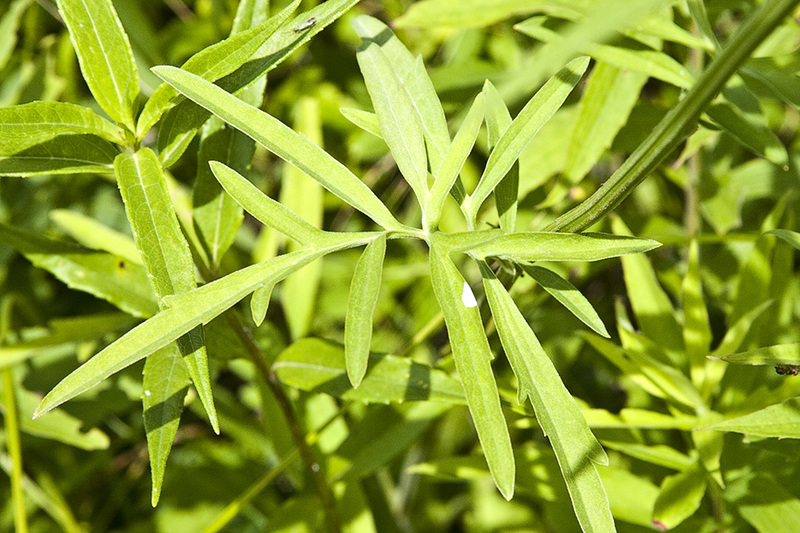 It is moderately to densely covered with coarse, short, straight, stiff, ascending, usually appressed hairs. It is sometimes hairless near the base. It also has scattered, minute, stalkless, yellow glands. Basal and lower stem leaves are lance-shaped to egg-shaped, inversely lance-shaped to inversely egg-shaped, or oblong in outline, up to 16″ long, and up to 6″ wide. They are on long leaf stalks. Each leaf is either deeply lobed (pinnatifid) with 3 to 9 narrow lobes cut nearly to the midvein or pinnately divided into 3 to 9 narrow leaflets. The leaflets on pinnate leaves are often toothed and shallowly or deeply lobed. The ultimate lobes and undivided leaflets are narrowly lance-shaped to egg-shaped, up to 6″ long, and up to 1⅜″ wide. They have 1 or 3 main, parallel veins. The upper and lower surfaces are rough to the touch. They are moderately to densely covered with short, straight, stiff, sharp, appressed to more or less spreading hairs. They are also dotted with scattered, minute, stalkless or impressed, yellow glands. The margins are usually untoothed. 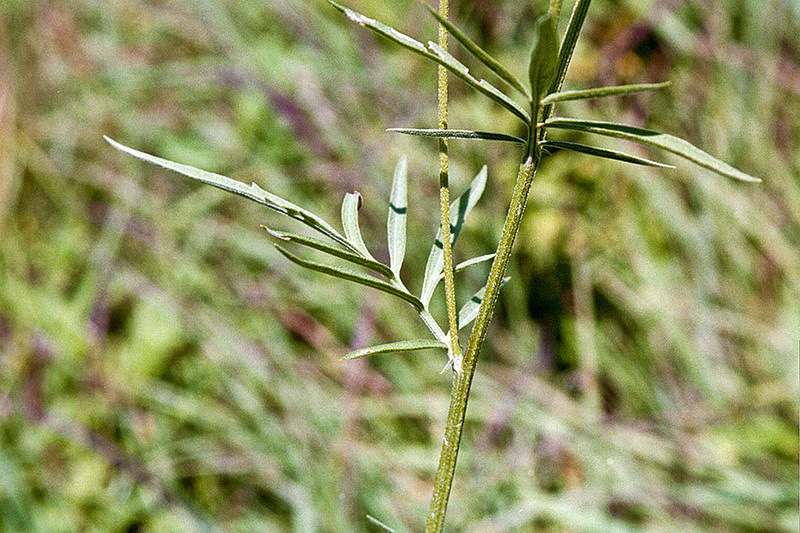 The leaves become smaller, shorter stalked, and less divided as they ascend the stem. 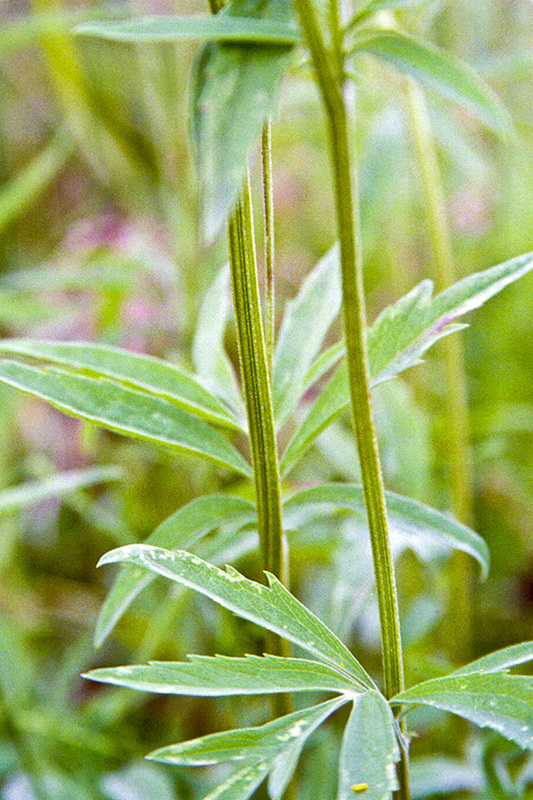 Upper stem leaves are stalkless and often undivided and lance-shaped. The inflorescence is a single, showy flower head at the end of each stem and branch. 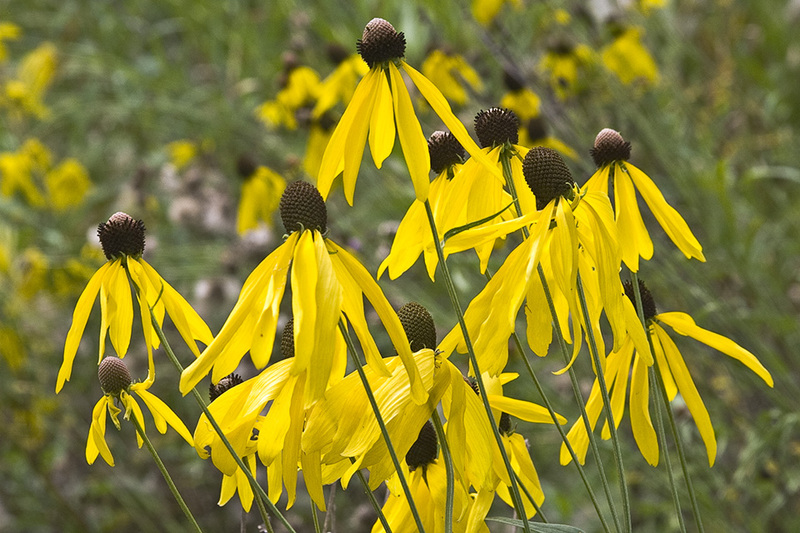 Most plants have 1 to 12 flower heads. 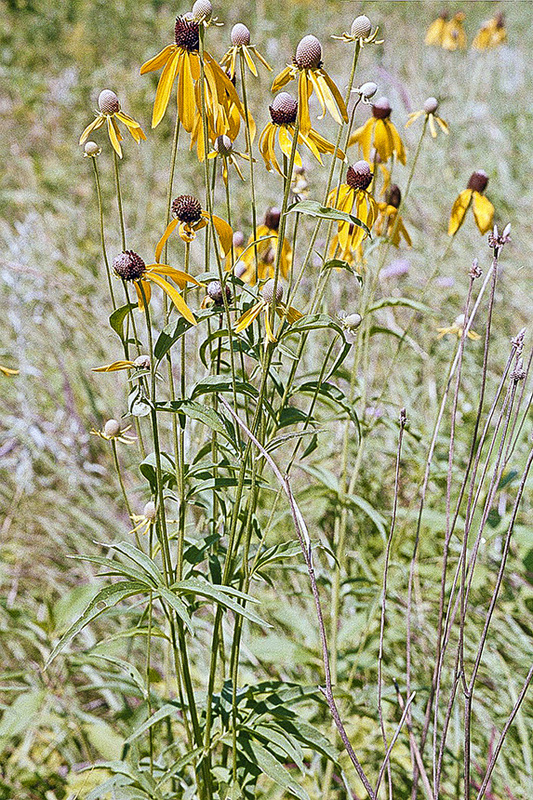 The flower heads are held well above the leaves. 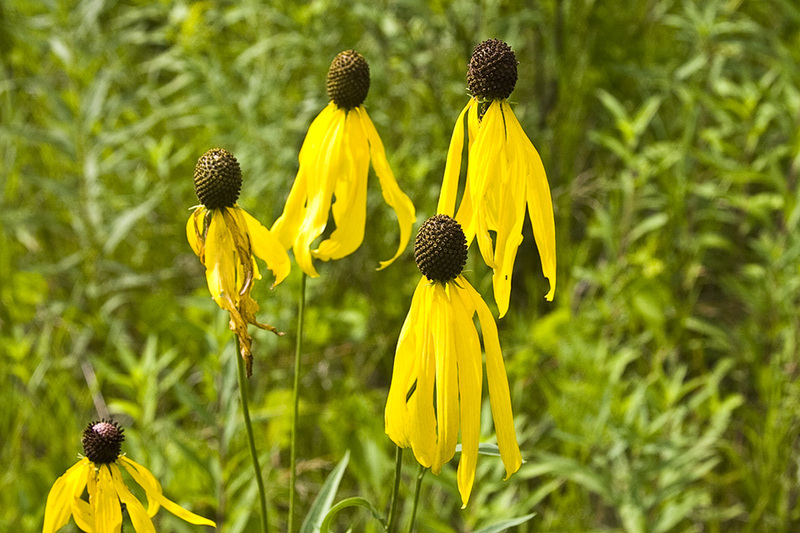 Each flower head is at the end if a leafless, prominently ribbed, 1¼″ to 10½″ long stalk (peduncle). 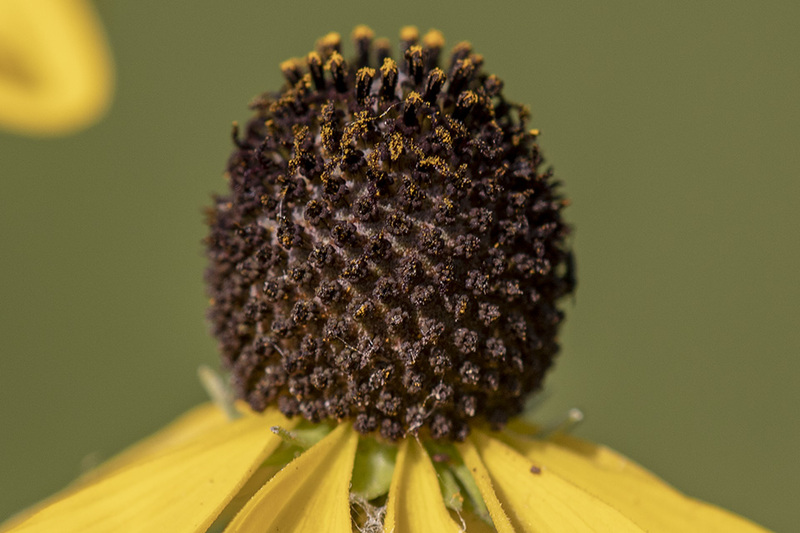 The whorl of bracts at the base of the flower head (involucre) is narrowly saucer-shaped, more or less round with a shallow depth. 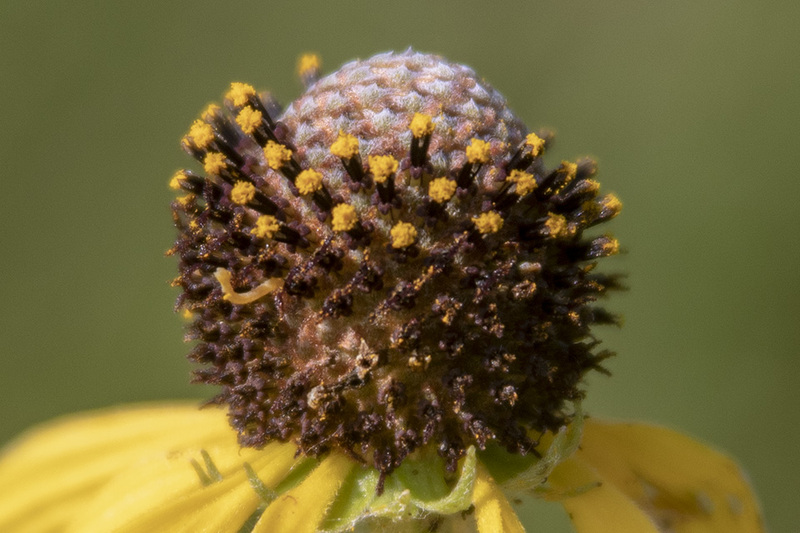 It is composed of 10 to 15 bracts (phyllaries) in 2 overlapping series. The outer phyllaries are linear, ⅛″ to ⅝″ long, and 1 ⁄32″ to ⅛″ wide. The inner phyllaries are narrowly egg-shaped, ⅛″ to ¼″ long, and 1 ⁄64″ to ⅛″ wide. 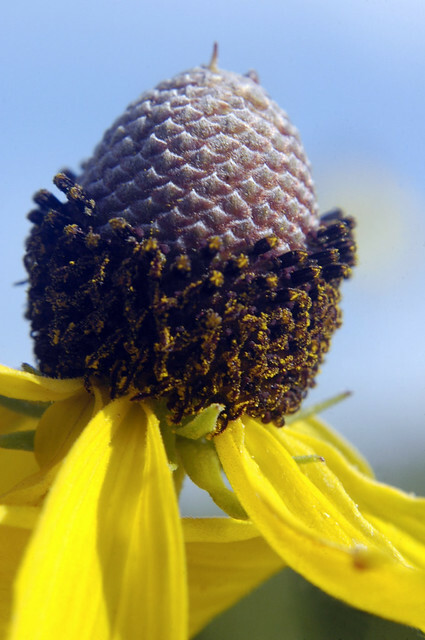 The flower head has 6 to 15 ray florets and 100 to 200 or more disk florets. The ray florets are yellow, linear ellipse-shaped to oblong inversely egg-shaped, 13 ⁄16″ to 2⅜″ long, and 3 ⁄16″ to ⅝″ wide. They droop downward at the base of the receptacle. The receptacle is usually oblong or egg-shaped, sometimes nearly globe-shaped, ⅜″ to 1″ long, and ⅜″ to ¾″ wide. It is covered with disk florets. The disk florets are 1 ⁄16″ to ⅛″ wide and greenish-yellow, sometimes purple tinged toward the tip. The fruit is a dry, one-seeded, 1 ⁄16″ to ⅛″ long seed capsule (cypsela). The tip of the cypsela is flattened and has no hairs but often 1 or 2 tooth-like projections. 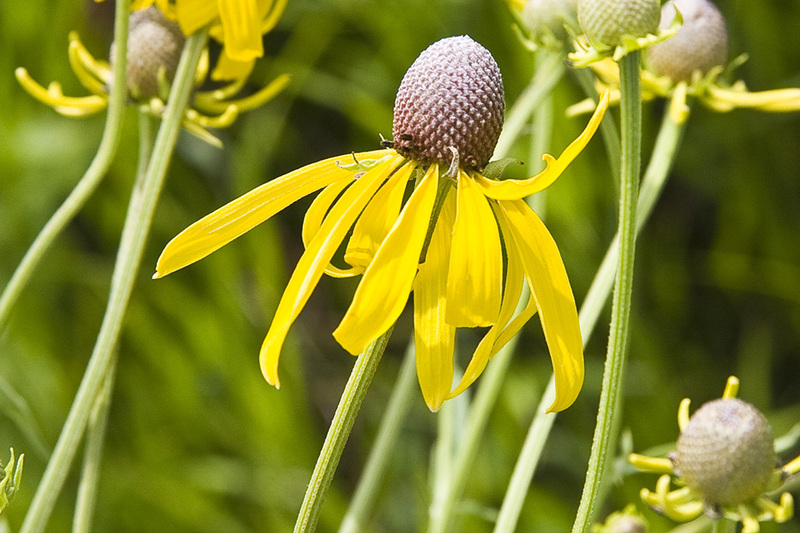 Long-headed coneflower (Ratibida columnifera) is usually shorter, no more than 24″ in height. The ray florets are shorter, no more than 1⅜″ long. The disk is column-shaped and much longer, up to 2″ long. 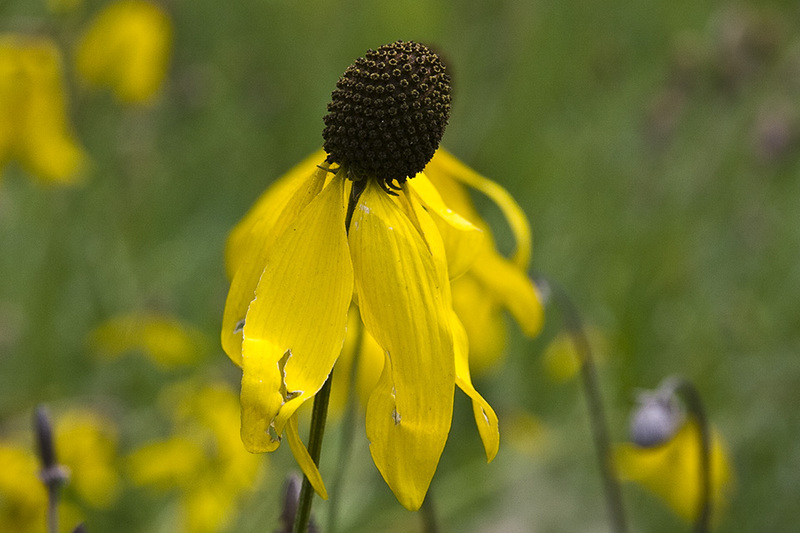 Todays plant is a tall prairie plant, the Grey-Headed Coneflower (Ratibida Pinnata). A sunny reminder of a wonderful afternoon, with a very special person, my beloved husband.